Michelle Paver’s new novel is an outstanding feat of story-telling, firmly rooted in the Gothic tradition, which pays homage to the late, great master of the ghost story, M.R James. A preamble, set in the 60’s, introduces us to elderly spinster Maud, who has lived alone in a decaying manor house deep in the Suffolk Fens ever since the tragic day in 1913 when her father committed murder in a fit of insanity. He has since become infamous for a trilogy of Richard Dadd-style paintings featuring medieval demons, but upon his death, Maud finds herself the subject of prying journalists. The rest of the book follows the story of Maud’s lonely childhood, back in the early 1900’s. We learn how Maud’s father had dominated and sexually exploited his vulnerable young Belgian wife, and see his belittling attitude towards Maud and his scorn for her attempts to win his approval by taking on the housekeeping duties after the death of her mother. Maud, a clever, scholarly girl, dreams of becoming her father’s amanuensis and begins helping him with his research into a medieval mystic, but he is unimpressed by her efforts. After her father discovers a medieval ‘Doom’ painting in the local graveyard – based on the real-life Wenhaston Doom, found under whitewash in the 1890s – he is beset by strange dreams and becomes convinced that unhallowed demonic forces have been unleashed by the painting. Maud seeks solace from her father’s tyranny in the dank beauty of the Fens, her friendship with Clem, a kindly gardener’s boy, and her pet magpie, Chatterpie, but after her father forbids her liason and has the magpie killed she begins to turn against him. Struggling to understand his behaviour, which has become increasingly deranged, she turns to reading his diaries. As the demons of her father’s past are revealed to Maud, and us, by the diaries and he unravels still further, Maud must stand strong to save her beloved Fen and discover the truth about her father. 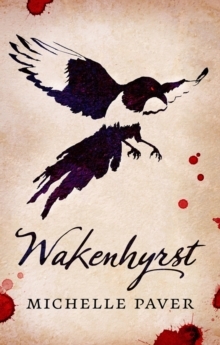 ‘Wakenhyrst’ is a truly compelling story – the brooding, stifling air of menace in Maud’s home, and the sinister superstitions of the Fen dwellers are vividly evoked and provide an air of impending doom which gathers pace deliciously. Maud is a wonderful heroine, full of nascent Suffragist spirit. Best of all, the book skilfully balances the supernatural with the possibility that the horrors are psychological in origin, keeping the reader on a tightrope of uncertainty throughout. Spell-binding stuff!